Come visit Island Paws and select your dog's breed from our display! 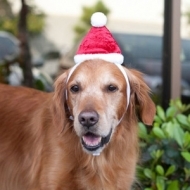 ZippyPaws Holiday Santa Hat adds a festive touch to your pups for holiday photos and parties! Two Velcro straps help to ensure a snug yet comfortable fit. Comes in two sizes. 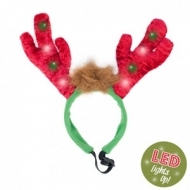 ZippyPaws Holiday LED Antlers light up! Fun red-and-green flashing lights add festive cheer to your dog this holiday season. Headband is lightweight and includes adjustable elastic band for comfort. LED lights turn on at the touch of a button.